At Cross of Grace, music sets the tone for our worship, feeds our souls, offers a way to share our talents, and serves as an excuse for fun and fellowship. Whether your preference is a Bach chorale, a rocking praise song, folk music from an acoustic guitar, or the unmistakable beauty of a synchronized hand bell choir, you can find it at Cross of Grace. Here is some information about some of the ways you can be involved in the music ministries. Cross of Grace's church choir meets in the sanctuary every Wednesday at 7pm for a casual and fun rehearsal time. Director Jeannie Ellenberger guides the choir through inspiring and diverse choral music. The choir offers its gift of music primarily during the 8:30am Sunday worship services. All ages and abilities are welcome. Join us and make a joyful noise! Click here for more info about Cross of Grace’s choir. Handbell music is a beloved tradition in Lutheran churches, especially at Cross of Grace. Due to the incredible interest in participating, we currently have two different adult handbell choirs! All ages and abilities are welcome. Even if you have no experience, the talented director, Susan Oxley, can guide you and help you make beautiful music. 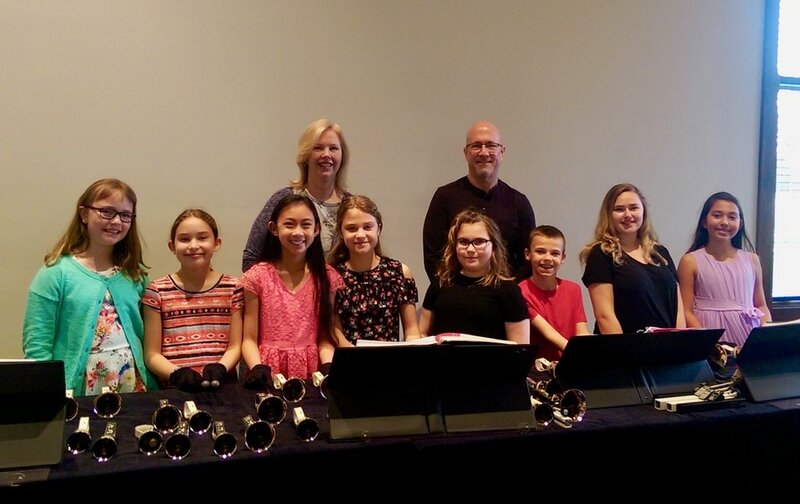 Our handbell choirs perform at both worship services. Rehearsals are Sunday evenings. Contact Susan (lancesusanoxley@hotmail.com) if you would like to participate. Cross of Grace is blessed with incredibly talented musicians who combine their gifts and lead the musical portions of the 10:45am service. Do you play an instrument or would you like to contribute your vocal talents to the group? If so, contact our Contemporary Music Minister Kaitlyn Ferry (kaitlyn@crossofgrace.org) or go ahead and come to rehearsal on Thursdays at 7pm in the sanctuary.